Session I: Government’s roles in underpinning and promotion of the knowledge economy environment. Session II: Driving towards effective development plan based on knowledge economy: prerequisites and mechanisms. Session III: Knowledge economy methodology and the education environment. E. Prof. Dr. Mohammed Salman, Director of Innovation and Enterprise, Kuwait Foundation for the Advancement of Sciences (KFAS), Kuwait. Cathy Garner, Director of Work Foundation, UK. Daniele Archibugi, Research Director, Italian National Research Council, Italy. Justin Hill, Senior Private Sector Development Specialist, World Bank, USA. Sami Marroum, Founding Director of Innovation and Policy Initiative, INSEAD, France. In addition, Prof. Ahmed also gave a three hours workshop on “KM Methodology towards Achieving: Cost Saving, Improving Productivity and Enhancing Profitability”. 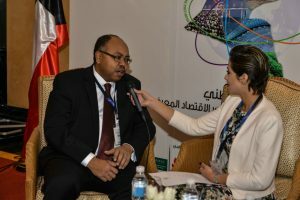 The session was attended by policy makers and businesses from across the Arab world. 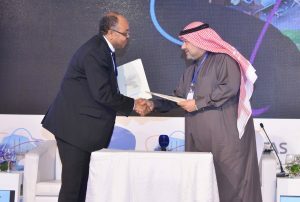 Lastly, during the conference, Prof. Ahmed signed an MOU on behalf of WASD and MEKEI, agreeing to collaborate and engage in various activities with the Kuwait Government Supreme Council for Planning and Development in relation to Kuwait’s National Project for Knowledge Economy (NPKE). The aim of the MOU is to promote co-operation between the three institutions in teaching, consultancy, capacity building and scientific research. Among the different items discussed were the co-operation in the joint delivery of a “Chief Knowledge Officer (CKO) International Course” in Kuwait, starting early September 2016; consultancy on a wide range of knowledge management (KM) issues; and the development of joint consultancy research activities on the performance and transformation of the State of Kuwait into a sustainability, knowledge-intensive economy.